The end of second month in the New Year has come to its last day, and if you have been thinking about getting a website, this is a good time to do so. Why did I say that? 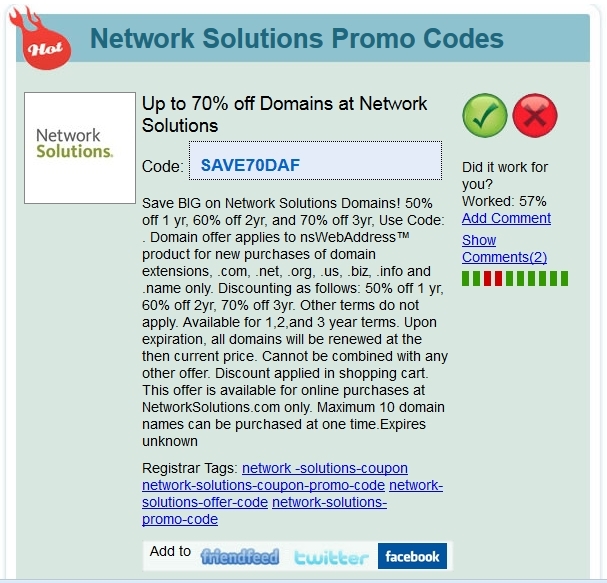 It is because Network solutions coupons is offering some wonderful coupons for domain name. You can find special promote codes by clicking on the link. You can get up to 50% off the first year, 60% off for two years, and 70% off for three years. This will amount up to a huge savings. I bought all my domains through Blogger, and they were very affordable, but were not at such a deep discount like this. 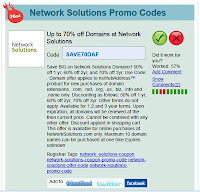 At Network Solutions, you can also find hosting discount, domain renewal and other services using their promote codes. I wish I was savvier at knowing how everything works, especially when it comes to technology and website related areas. Thus, professional specialists come to the rescue for people like me should I need their help one day. Many of us know just enough to get by in this vast online business or to be precised, running a website in its general term! So if you are looking for solutions, visit Network Solutions and get in contact with them for answers.